Review date: 30 September 1999. Cooling fans are essential for the reliable operation of modern PCs, and even essential for the survival of some of the components of higher powered systems. Fan failures don't usually actually cause anything to blow up, but overheated hard drives can develop data errors, and overheated CPUs and other components cause hangs and crashes. The Just Cooler FA-100 Fan Alarm System is a little gadget that aims to protect you from fan failures, by monitoring up to four fans and sounding an alarm if something goes wrong. It screws into one of the slots on the back of the PC, but does not plug into a slot on the motherboard. It should retail for less than $60 (Australian). The Fan Alarm is a simple enough gizmo. It's got one regular four pin Molex power connector of its own, and four pass-through-connectors. Two of them are the modern three-pin style as used by fans that run from headers on current motherboards and use the third wire to report their speed, and two are for old-fashioned Molex connector powered fans. There are four little DIP switches on the Fan Alarm, matching the numbered fan connectors, and you turn on the switches that match a connector to which you have attached a fan. The back panel, which is the part that screws into the slot on the back of the PC, has four LEDs and a reset button. 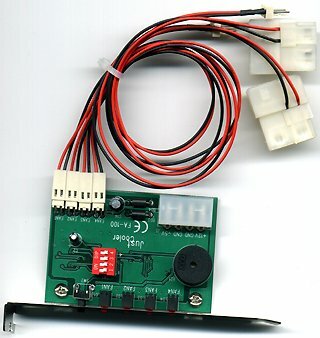 If any of the connectors goes open circuit, the Fan Alarm makes an obnoxious noise and lights up the LED corresponding to the fan which has gone open circuit. Pushing the reset button silences the alarm, but the light stays on until the problem is fixed. The problem with this brilliant idea is that fans don't, generally, fail by going open circuit. Your standard computer fan has a little brushless motor in it, which is efficient and won't wear out and, importantly, probably won't burn out, either. If you jam a standard DC motor with brushes, such as you'll find in, say, a cordless drill, it'll behave, electrically, somewhat like a short circuit. The slower plain brushed motors turn, the more current they draw. A stalled brushed motor will get hot, quickly, and if it stays jammed it will sooner or later smoke a brush, or burn out a winding, or melt a supply wire, or (for better motors) pop a built-in fuse. When any of these things happens, the motor goes open circuit; the current path is cut. Brushless motors, on the other hand, don't mind being jammed nearly as much. A regular computer fan that's unable to turn will draw more current than normal - maybe twice as much, maybe less - and just sit there peacefully waiting for the obstruction to go away. It may never burn out; it's not meant to leave one set of coils energised all the time, and it's meant to keep itself cool with its own airflow, but in all likelihood the low-performance motor won't make enough heat to hurt itself. Lest you think I'm talking through my hat, rest assured that I have scientifically tested this assertion. I grabbed an elderly 80mm case fan, stuck it in my scientific bench vise, wired it up to my scientific bench power supply and multimeter, started it running (current about 200mA at 12 volts), and jammed it with a highly scientific stick (jammed current about 400mA). I then very scientifically went away for half an hour. When I returned, the current had for some reason dropped to about 300mA, and the hub of the fan was too hot to hold a finger on, but it still spun happily when the obstruction was removed, and had no "dead spots" without torque at any point in its rotation, that might indicate a burned coil or two. I left it for another half hour; it was still fine. At this point I terminated the experiment; I don't know how long you'd have to wait for this fan to go open circuit, if it ever would, but I'll bet you it'd be longer than whatever it was meant to be keeping cool would survive. Perhaps other fans are more fragile; I only tried one. But this was one thoroughly cheap and nasty sleeve-bearing fan with some years of service already on it; how dodgy does a fan have to be to fail in the way the Fan Alarm wants? It's in the nature of brushless motors, by the way, that they dissipate what heat they generate more efficiently than do brushed motors. Brushed motors have stationary magnets inside their "can" and a rotating armature with the coils on it; brushless motors have a rotating magnet spindle and stationary coils, fixed to the can. Since the coils are the thing that gets hot, fixing them to the can lets them cool off better than packing them onto a spindle in the middle of the motor. It's easy enough to set modern PCs to alert you when a three-wire fan's speed drops below a set figure; many current BIOSes let you set such a function, and you can also do it with Motherboard Monitor, a very popular program for keeping tabs on all sorts of hardware stats. Spotting failures in two-wire fans is more complex. You could perhaps do it by monitoring current and/or voltage and guessing that an increase meant a problem, but you'd need a reasonably sophisticated system to do that. Fans don't generally fail in five seconds, but slowly wear out over weeks, with the current creeping up towards the stalled value as the fan speed drops. There might well be nuisance-triggering problems if current varies with temperature, or if a power spike or hard drive spin-up causes a brief change in the supply voltage, or some such. So I don't know whether it's actually possible to do the two-wire fan monitoring job properly. But three-wire monitoring is built into current machines, and the Fan Alarm doesn't do even that properly. Because it only looks for open circuits, the Fan Alarm does not appear to detect jammed fans, at least not unless they burn themselves out. All it cares about is open circuits. If the fan plug disconnects itself (which is about as likely as elephants falling from the sky) the alarm will sound; likewise if something severs a fan wire. But if the fan bearings crap out, as the cheap sleeve bearings in many fans are wont to do when they run out of lubrication, the fan will just buzz and shudder and slow down and, eventually, freeze, and the Fan Alarm will alert you not at all. Perhaps I've missed something, but this product looks like a dud to me. It just doesn't seem to do the job. If you've got evidence to the contrary, please contact me at dan@dansdata.com.